The vacancy rate for the Charlottesville area are fairly consistent over the last 18 months, with a slight uptick recently. The key words are market knowledge, adaptation and patience. For Charlottesville/Albemarle – there are 1395 active properties, with 490 properties being vacant (35%). For the Charlottesville MSA* there are currently 2186 properties on the market, 757 of which (35%) are vacant. 21% of those 757 are new construction. There are almost 1200 residential properties actively on the market in CharlAlbemarle. Almost 400 of these show as vacant, while almost 300 of these vacant homes are new construction. For the entire market area, there are about 2,000 homes on the market, 600 of which are vacant, 450 of which are new construction. Unfortunately, there is going to be some pain felt in this market, and there are going to be some great opportunities for those willing and able to treat real estate investment the way it has traditionally been regarded – as a long term investment. The market is working – without a government bailout. As distasteful as it may be for some, the foreclosure companies are going to profit from this market. Advertising for these foreclosure companies will add revenue and profit to some companies’ respective bottom lines. Mortgage brokers and lenders will adapt.Â Those with knowledge and experience in short sales will (likely) thrive. REO specialists will profit. Buyers with cash and no house to sell will have much more leverage than those who do not. 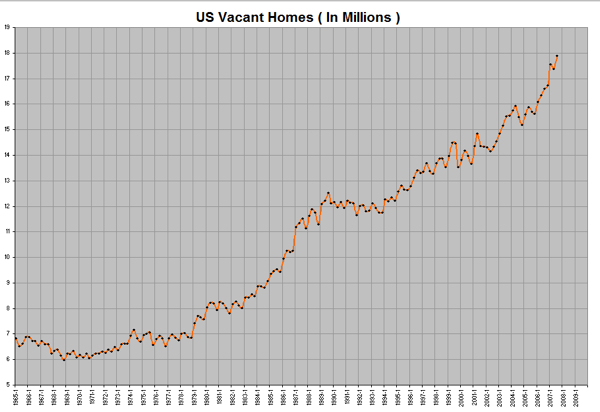 A simple example – take a look at Realtytrac’s traffic since September 2006. It’s up 66% so far this year alone. There are opportunities in every market. Who wants to partner with me to buy some investment properties? There are 47 vacant, active properties in Charlottesville/Albemarle that have been on the market for at least a year – think there might be some motivation in there somewhere? If you read me often you know this is nothing new.Â I do, however, want to call your attention to the real estate climate we are in right now.Â Most pundits are predicting an extended decline in the real estate market.Â While now might not be a time to buy, it is certainly a time to start researching where you want to deploy your capital next.Â You could call this the calm before the perfect storm. Of course, the United States population in 1965 was about 194 million. Today it’s about 303 million. Thus, a reasonable person would expect there to be more houses and more vacant houses. Update 11/2/2007: To put this foreclosure news in a bit more perspective, consider this: the number 1 state for foreclosures, Nevada, had 1 foreclosure for every 61 households. Virginia had 1 for every 441 households.